Liberec - A quieter voice. Marian Column. 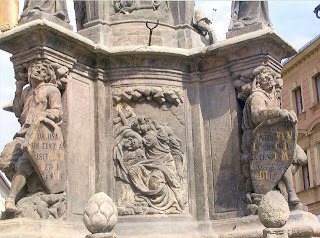 Liberec has a modest plague column, those petitions in stone to Mary for relief from recurrence of the Black Death, or thanks for at least sparing some of the population. This one was unusual because it is in the graveyard, unobtrusive, silent, not set in the showy loud middle of a square where it forces you to look. The column are is short. Overall, the impression is more like a solid, reliable pedestal than an overwhelming column with Mary up there somewhere. There are many reminders in Europe that the plague hit everywhere and often. 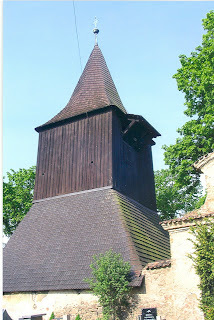 Here is a site with photos of Austrian Marian Columns, and references to others in Germany. 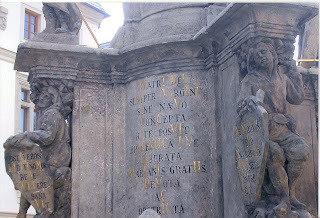 The Austrian columns are tall and rounded, without the multiple figures and shapes on the Czech columns. See //campus.udayton.edu/mary/resources/column. That source is a Marianist institution. 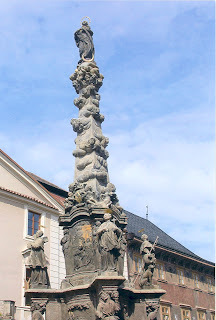 In the Czech Republic, the fashion for specific Plague columns appears to be from about 1715. They often show buboe-shaped tumescences and scenes of sufferers or saints. Plague was intermittent and devastating for centuries before that, however. See its course in 1348, and people's group and individual response patterns, at //www.eyewitnesstohistory.com/plague. 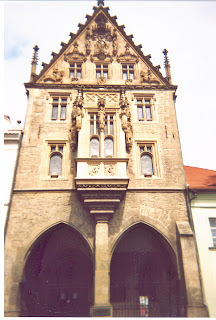 See the huge lump-type columns in more central towns, like Kutna Hora, see later post here. 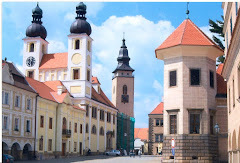 We did not get to Olomouc CZ, the town with an enormous one, but do an images search for it. O-l-o-m-o-u-c. How could Mary ignore its shouting. I like this simple one, nestled in Liberec. Please, help me. A small supplication amid the dead. Do see Liberec. * Why Mary and what is behind the column structure? Hers is not our particular tradition, but anyone can wonder - why turn to that particular person in times of devastation. Finding out is roundabout. The UDayton site, //campus.udayton.edu/mary/resources/column, collects these explanations for Mary on top of columns:, examples include showing her rectitude, firm faith; she is shown leaning against a column in early art and that shows she did not have labor pains ("dolor"? ); the column anticipates the suffering of the future; points to the end of pagan religion; mostly date from 15th-17th centuries, but there are reported such columns 1oth and 15th centuries; the round shape lets pilgrims move around it; stand for the Counter-Reformation; were votive, pilgrimage and rallying points. There is a list of exhibits of Marian art held at UDayton - none explore the Marian columns. //campus.udayton.edu/mary//exhgrp. The theme continues. Here is a modern memorial, a technically non-Marian column, but highly evocative, as here in Levoca, Slovakia. See Slovakia Road Ways. 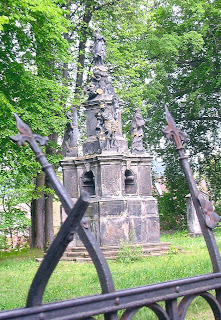 From a distance: The woman and child at the top look like a modern (medieval or renaissance dress) representation of madonna and child, but instead represent the women killed, shunned or tortured during the Inquisition and related periods, or merely caged for "immorality," as the explanation is now given at Levoca. Even the cage is on display. "The Burning Time" or "The Burning Times" are books on the topic of witch-type or paganistic persecutions, do a search for the titles. See also //www.religioustolerance.org/wic_burn1. and its overview, literature and research. 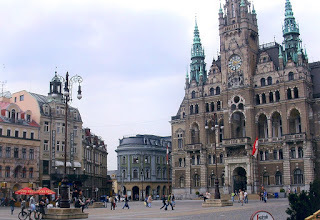 Liberec is in the northwest corner of the Czech Republic, Northern Bohemia, near the German border. It is a town that grew at the crossroads of several trade routes. Here is its castle, lovely reds and yellow ochres,. The castle is becoming a showplace for lovely local glass, crystal and jewelry. Northern Bohemia is known for that. See //www.glass.cz/help-visit.asp. 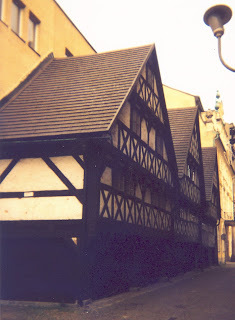 Near the square is a small row of half-timber craftsmen and weavers' houses, called the Waldstein Houses, dating from 1678-1681. Here they are - but compare these cramped camera angles to the elegant photos that the tourist bureau is able to take, probably with dangling cranes to suspend the photographer by the feet for the purpose. At street level, there is no glamorous vista reachable, especially with the large size of the facades. See the small windows, because glass and oiled paper cost. 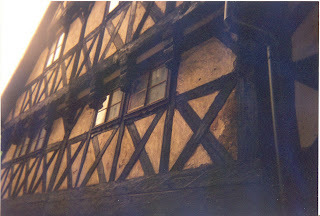 Read about half-timber construction at //architecture.about.com/library/blgloss-halftimbered. The spaces between the timbers were filled with rubble, broken dishes, or daub and wattle, very ecologically sound, then plastered. Using oak for timbers means long-lasting strength. It became a fancy art form in Britain and elsewhere. See www.britannica.com/eb/topic-252413/half-timber-worksee. This view shows how short the row of houses is, and that only the front parts of the buildings really survived. The rest of the structures are incorporated in a modern apartment building. At least they preserved this much. Excellent. 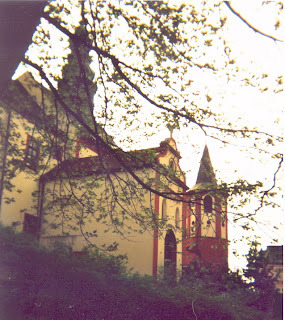 Liberec is in a mountainous area, with castles on hilltops. And traffic jams at rush hour, like anywhere. See //www.infolbc.cz/indexen; and terrain shown at . liberec.turistik.cz/en/. Now that we are back, I wonder if the castle we thought was in Slovakia is really here, outside Liberec. We did stop and just take pictures as we went. Look at Slovakia Road Ways at the Zilina post. There is a fine town square, with an excellent town hall - remember that towns only got their marketing privileges from the reigning monarch, and had to keep up appearances. Rudolph II (see Iron Man post in Prague about him) gave Liberec its market "license" status. Choose a cafe with umbrellas, feet up a little, aahh. There is a Liberec webcam posted here, but I gave up on the load time. You try at www.webcams.cz/webcam.php#. Why Liberec? Sometimes, pick a town in a new area that is in the range of something else and just relax and go see. We were leaving Thieriesensdadt, or Terezin, the ghetto-concentration camp - where Petr Ginz and others were sent, and most then died, there or at a subsequent extermination or labor camp. This town is nearby, and we thought we had some time before Plzen and Prague. So, see a regular town, then circle down to the Big Prague. 1. The Plague Column - see the base, with its prayers and invocations; as well as the tall structure. There is usually Mary at the top, with a crown of stars. 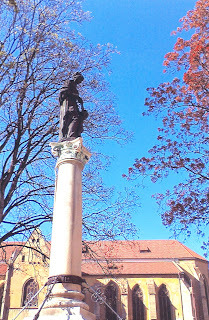 Do an images search for marian plague column, and you can see the type, and its components in European town squares, especially in eastern or central Europe. Kutna Hora has a fine plague column. The town is a UNESCO World Heritage site. This is what it was like to have Plague. See historymedren.about.com/od/theblackdeath/a/death_defined. No wonder people rejoiced in 1715 that only half the population died from it, and the survivors were spared. Some tours are organized totally around UNESCO sites - see //www.czechadventure.cz/en/tours/Sightseeing-tours/One-Week/Czech-Republic-Unesco-Heritage-Trail. We see the ones nearby wherever we are, and do see most of them. 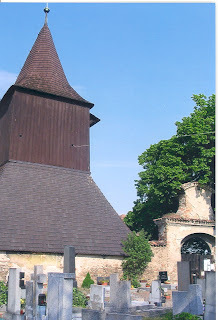 Here is a photo site of Czech Republic Highlights, with a fine Marian or Plague column view here at Kutna Hora. richard-seaman.com/Travel/CzechRepublic/Highlights/index. With tree branches, hard to get a clear shot, but you at least can see the flying buttresses here - unusual and difficult with largely brick construction, so there are so many. The roof resembles a peaky crown. Thirteenth-Fourteenth Centuries, some variation between sites on exact dates. History at www.travel.cz/guide/126/index_en. 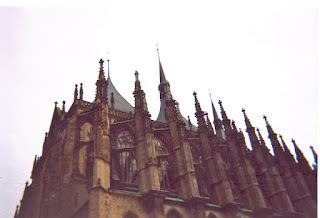 Designed by John Parler, son of Peter Parler who built the great St. Vitus in Prague. Here is a site about Saint Barbara herself, about 300 AD, at //sill-www.army.mil/pao/pabarbar. She was tortured and beheaded by her own father when he returned to find his bath house design redone by Barbara, who had converted to Christianity in his absence, and put in windows to resemble the trinity. She later became associated with safety from gunpowder, a patroness of artillerymen. Then again, this site points out how little is known, how many centuries passed before any mention, and etc. See www.newadvent.org/cathen/02284d. Her life is to remind people of anger?? See www.newadvent.org/cathen/02284d. Kutna Hora - mining,double gate? We may prove ourselves wrong here, but we think this nice double gate, one for each line of traffic, and ease in collecting taxes/tolls, is Kutna Hora. Meanwhile, here is a fine history of Kutna Hora and its mining - silver. See//chramsvatebarbory.cz/kutna-hora-history. 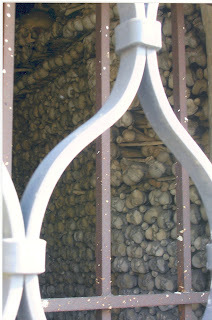 Destination: We were headed elsewhere, to a glamorous and elaborate ossuary or charnel house* at Sedlec, at a monastery in another direction outside Kutna Hora. Someone there in the 19th century constructed chandeliers and sconces and other Martha Stewart decorations, made of what you happen to have on hand, here hands themselves, bones and skulls. Out of mass graves from Plague or other war times. The Thirty Years' War also slaughtered many religiously motivated combatants, early 17th century. The stop instead. We never got to Sedlec. 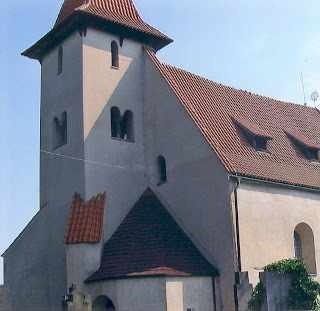 See what we found instead, on the side of the road on the way to Kutna Hora: a traditional old walled church-defense complex, no signs, and its authentic charnel house. No designer additions. 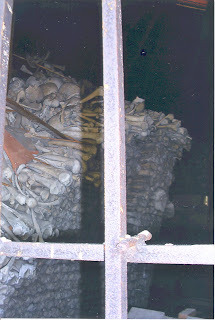 Floor to ceiling, respectfully and neatly stacked bones and skulls, in an octagonal charnel house,* open windows except for the bars. There was a caretaker, watching us as he worked in the churchyard, but not following. These consist of a thick, high wall, a built-in tower that appears for defense and lookout, in a traditional architectural shape of a square tower and peaked roof like a witch's hat, atop another and much larger square structure below. That tower on tower shape would be good for defense because ladders could not be put all the way up. But bad because the wood would ignite. Then there is a free-standing church building inside, and another free-standing building, the charnel house. There is the octagonal charnel house here, skulls and bones, just behind the church. There is a similarly small charnel house, that does invite visitors inside, in very small groups, very respectful, at Kudowa Zdroj, Poland. See post at Poland Road Ways. Mass graves were a necessity. Do a search for mass graves plague, and find them at Venice, Athens, all over Europe. The church's graveyard with individual headstones is here just inside the walls. Yale would love this. Maybe they would be motivated to return Geronimo. See//www.yalealumnimagazine.com/issues/2006_05/notebook. See//www.cbsnews.com/stories/2003/10/02/60minutes/main576332.shtml. Advantage of the sudden find: Slow walk around, breathe in, breathe out, stretch, sit, think back, then with so much else to see, we skipped Sedlec. 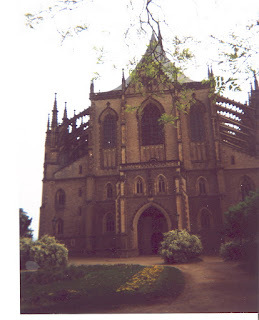 See other posts on Kutna Hora, and overview of the town at //thesalmons.org/lynn/wh-czech. * You can take a virtual tour of Sedlec yourself. At Sedec, we had read that the bones of plague and/or thirty-years' war victims were arranged in the 19th century in patterns and chandeliers. Many tour books feature this extravaganza. See the photos of all this at //richard-seaman.com/Travel/CzechRepublic/Highlights/index. Charnel houses are a practical approach to small graveyard areas: after a time, dig up and place all together in one building. Usually these are careful arrangements, from the tidy stack to the more bizarre decorative type, see the one we saw in Poland at _____________ and here is another one in Austria (that we did not see) at www.virtualtourist.com/travel/Europe/Austria/Bundesland_Oberoesterreich/Hallstatt-329225/Things_To_Do-Hallstatt-BR-1. Just because a square is empty of cars does not mean you are welcome to park yours there. Always good to check the rules before you launch. Start at //www.stopin-prague.com/blog/driving-in-czech-republic. Some rules. Note this - instead of paying tolls on non-motorways, buy a highway coupon (at a gas station) and stick it to the windshield. Lights on at all times. In a traffic jam, cars must create a lane for emergency vehicles. An unbroken yellow line to the right means no parking. "Stopping" is permitted, however. An accident with property damage about 2500 or more must be reported to police. No radar detectors. If an accident, there are procedures to follow, read up. Alcohol. As in many parts of Europe, blood alcohol tolerance is zero. Find where you are going to stay, park and stay there. Period. Pick a place where you can walk to your supper, and to libations if you indulge. Road signs, speed limits. That site also lists common road signs, in Czech with translation, gives speed limits (you can't go as fast as legend here in US says about Europe), parking rules and other vitals. And reproduces the symbols and what they mean. They are not always obvious, so carry them with you. Your guide book may not have all of them. For example, a big red empty circle means absolute prohibition to any vehicle going there. Some show a car with a line through. That means no four-wheeled vehicles. NOTE ALSO. Go slow if you travel in spring and fall, when there might be freezes. Some countries restrict sand and salt use to only the most major roads. Rentals. Rent your car from an Eastern European country if your travel is mostly there. There may be restrictions from Vienna, for example, in driving to or insurance covering certain places for concern of car theft. Know these in advance, and fly in with information in advance. We make rental arrangements from US, and check it all out there first. The Diary of Petr Ginz - Places of Petr Ginz. The Occupation. Petr Ginz was a boy in Prague during the German occupation. He kept a diary, now published in English in 2007 as "The Diary of Petr Ginz 1941-42." Locations that Petr Ginz names, or where he went, are laid out now in photographs and comments at a Europe Road Ways companion blog, Places of Petr Ginz. 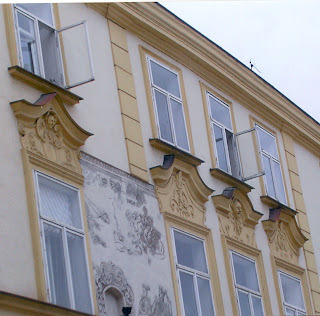 The places include references to Prague, where the family lived; Plzen, nearby, where there is a great synagogue; Hradec Kralove, his Christian mother's home town -here is a picture of some Renaissance sgraffito * on the side of a building in Hradec Kralove; and the Sudetenland, on the German border, where others were from. Petr was sent at 14, the age when Mischling children were to be separated from their families, to the ghetto created at the old garrison town of Theresienstadt (Terezin); and ultimately to Auschwitz, at the town of Osweicim (Auschwitz), Poland, where he was killed. The war references are poignant, yet matter-of-fact. 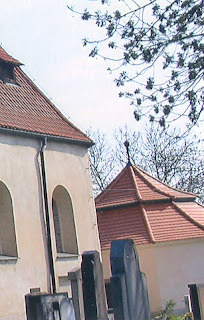 See Places of Petr Ginz, Assassination of Reinhard Heydrich at St. Cyril's Church. Also see the 1975-76 film, "Operation Daybreak," for views of Prague itself, and a tragic, courageous war story of the Czech Resistance and the assassination. The diary was discovered in 1993 in the Jewish museum in Jerusalem, along with some of his drawings and science fiction and other writings. It is edited by his sister, Chava Pressburger, who adds an introduction and parts of her own diary; and translated by Elena Lappin, Atlantic Monthly Press NY 2007. Meet Ms. Pressburger at www.radio.cz/en/article/63435. Petr is a child of a mixed Jewish-Aryan marriage, called a Mischling by the Nuremberg laws of the German occupation in WWII. See www.owlnet.rice.edu/~rar4619/nuremburg.html. A "Mischling" could be designated in various degrees from pure Aryan. See www.holocaust-history.org/short-essays/nuremberg-laws.shtml. The concept was "mongrel," as seen when you do an Images search for Mischling. All dogs on the first page, except for a copy of a Nazi certificate for Mischling I. The panorama of his short life ended at his age 16 in Auschwitz, a concentration camp that also had held Anne Frank for a time, I understand, before she was sent to her death at another camp, Bergen Belsen, not far away. * Sgraffito - a building decoration technique, layers of colored material, then scrape off top layers in drawing or other patterns. Scroll down this photo website and see the sgraffito - //richard-seaman.com/Travel/CzechRepublic/Highlights/index.